When reading Schwinn Discover Women’s Hybrid Bike Reviews, what are you aiming for? 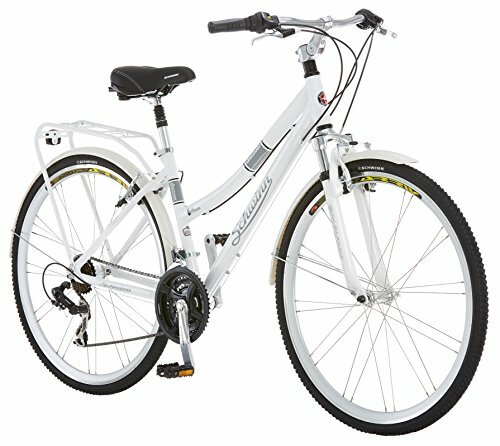 Is it a well-built and durable bike? Do you want to spend less for a quality and highly-versatile bike? Or are you looking for a user-friendly bike? The most likely answer is all-the-above plus more. I mean, bikes are becoming a popular choice for women. They are easy to use, help in a range of exercises, and are available in many varieties suitable for all kinds of women. So, with so many brands and types of women hybrid bikes available in the market, what features should inspire you to get the Schwinn Discover Women’s Hybrid Bike? Riding a bike should be less of a challenge and more of a fun activity. This is probably what inspired Schwinn to come up with this bike. Featuring an aluminum frame, the bike is quite light and weighs approximately 46pounds. This makes it simple and easy to move around or carry. It’s also quite strong and can without regular use as well as the elements. You don’t need to worry about the bike rusting since aluminum is resistant against corrosion. Riding a cheap mountain bike for extended periods or vigorously can come with lots of pain and discomfort. This can actually discourage you from going back. And to minimize the possibility of this, the best hybrid bikes under 500 dollars by Schwinn comes with an ergonomically designed and extra padded seat. In addition to offering the right support, and minimizing unnecessary movement, the seat also provides the right comfort. Cases of aching bums, backs, or discomfort are minimal. To ensure the rider has the best experience, the Schwinn Discover women’s hybrid bike features swept-back handlebars. They are easy and smooth on the hands and offer the right bike grip for different kinds of hands. What’s more, the handlebars minimize any obstruction, especially when getting onto the best bike. And for an even better experience, it also comes with an adjustable stem. You can move it up or down to suit your need or preferences at will. Courtesy of quality suspension fork, you don’t have to bear the road vibrations or shocks. The fork suspension bike features advanced technology that allows the bike to absorb the most impact. This makes the hybrid cycle ideal for different terrains whether smooths asphalt/tarmac surfaces, rough unbeaten paths, and more. It can also accommodate different kinds of women- small, medium, plus size and more. Stopping the bike even after a very fast dash is made easier thanks to the ProMax Linear brakes. The pull-type brakes are highly-sensitive and will respond even at the slightest application. The material used is effective in any kind of weather whether sunny, rainy, dusty or any other. In addition to the fast response, the brakes firmly grasp the wheel minimizing any skidding or erratic stops. You, therefore, are less likely to bump into other riders, knock obstacles, or fading brakes. The above review on Schwinn’s Discover women’s hybrid bike has brought several things into perspective. The aluminum built bike features a good and ergonomic design that makes getting on and off the bike easy. It comes with swept-back and adjustable handlebars for improved convenience. And to assure a user of comfort, the bike features padded seats as well as easy-to-reach gear changing dials on the handlebars. However, the bikes higher than usual handlebars make it hard for short people to reach the ground.